Yesterday was my husband and my anniversary so I thought I would post the recipe for the signature cocktail we had at our wedding. It is named after my mother’s maiden name, which is fitting because she is Swedish and the cocktail has a Swedish twist. As I have said before I recommend Svedka vodka. My husband prefers the flavor (I can’t tell the difference) and it is reasonably priced. The Lingonberry Drink Concentrate can be bought at your local IKEA. Do we see the Swedish theme? It was also perfect for the wedding because the ingredients matched our wedding colors (yellow and red). 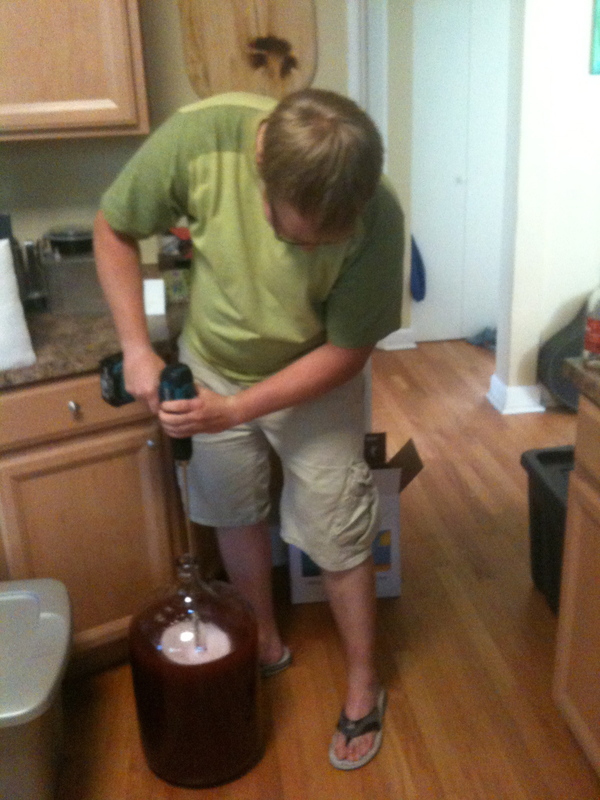 When we made it for the wedding there was a whopping 5 gallons that was all drank, before we finished with the photos I might add, and Jack used the power drill and a stirring rod he made to mix it. 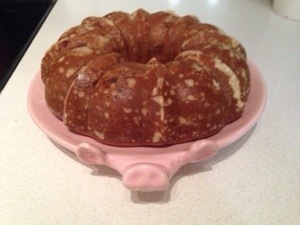 Last weekend my husband and I were having some new friends over and I was really excited to try out my new bundt pan so I found a great recipe on Pinterest. 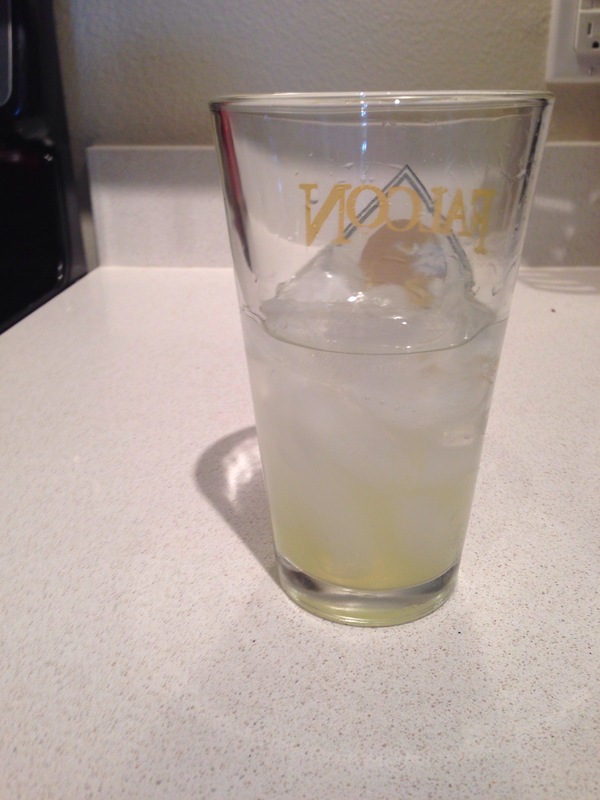 One of the ingredients was limoncello and I got to thinking about creating a new mixed drink with limoncello and Lemon Vodka Drop was the result! 1. 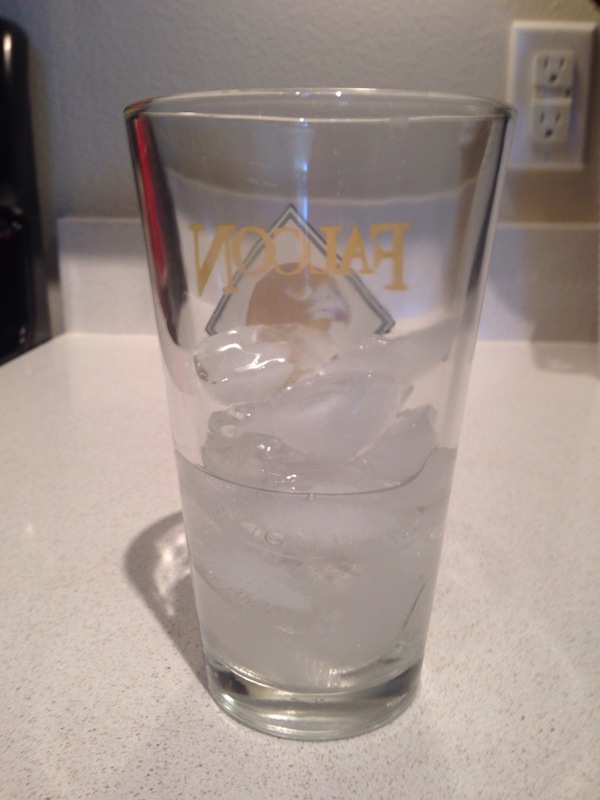 Fill your glass mostly full with ice cubes. 2. Mostly cover your ice cubes with vodka. 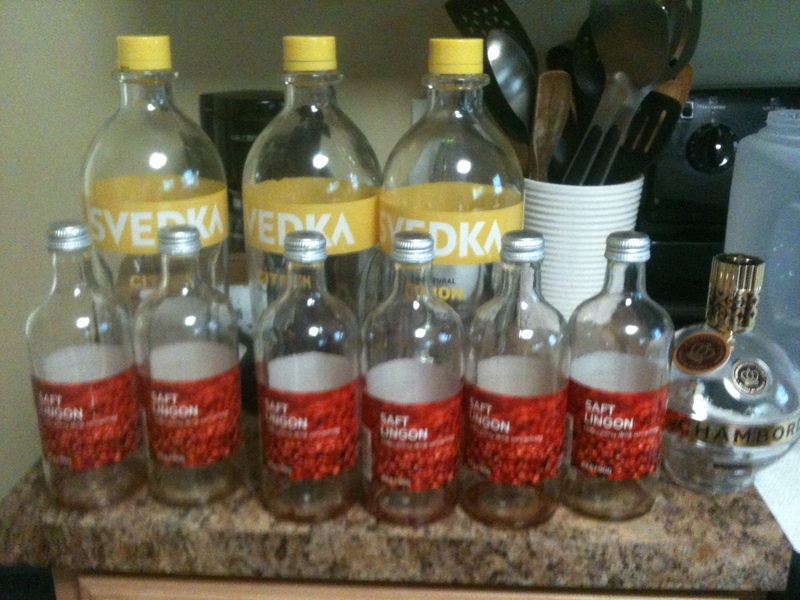 I use Svedka because it is affordable but high quality. 3. Add a splash of limoncello. 4. Fill the glass the rest of the way with sprite. 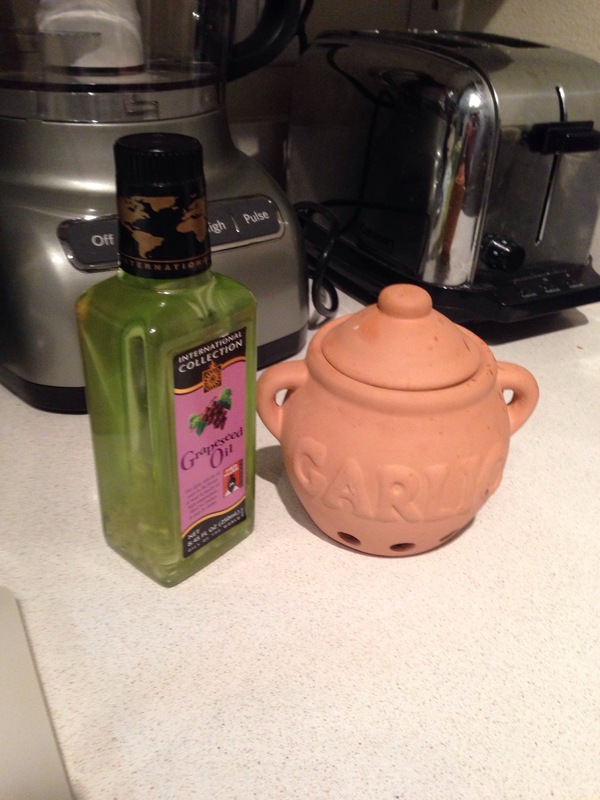 Years ago I bought garlic grape seed oil at a winery and loved using it to cook. I have been on the hunt for another bottle since running out and have been unsuccessful in countless grocery stores and specialty shops. A few months ago I decided to go ahead and try to make my own. I bought a small bottle of grape seed oil (8.45 fl. oz.) and coarsely chopped 4-5 garlic cloves and shoved them in the space remaining in the new bottle. I left it to sit for 2 and a half months and tried it for the first time this morning. It worked out wonderfully. When you cook with this oil the garlic gives the kitchen a wonderful smell and it gives your food a mild garlic flavor. The grape seed oil has a high smoking temperature so you can use it for almost anything. This morning I used it to heat up some sausage links and then added some butter to the pan to cook eggs over medium. It is also really good for roasting vegetables, sautéing fish or for dipping crusty bread in with some cracked pepper added of course. 1. Chop all of your veggies. I liked the combination of the veggies listed above but any of your favorite veggies can be substituted. Arrange your leaves and veggies on your plate and spinkle some lemon juice on top. 2. Heat a skillet on medium high heat with 1 tablespoon of olive oil and butter. When the butter is melted, add the shrimp and cook until pink. Pour the shrimp over the veggies on your plate. 3. 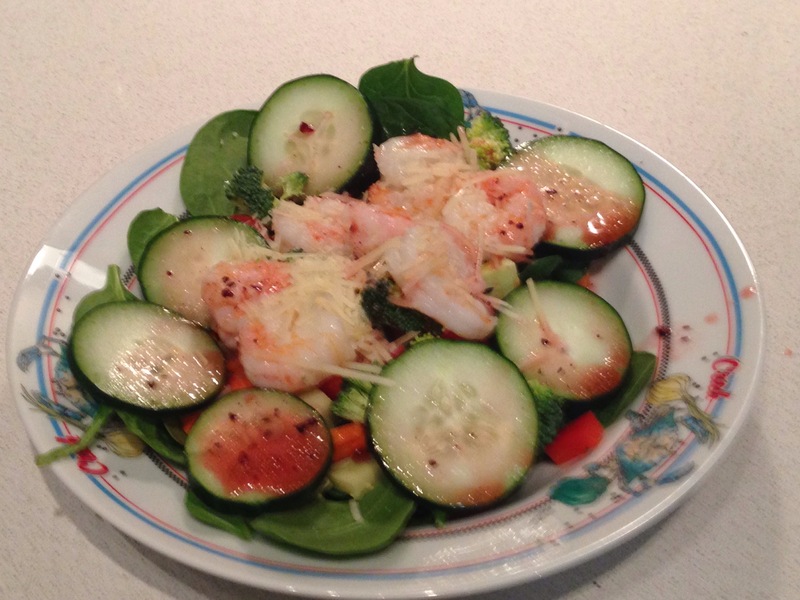 Sprinkle with shredded Parmesan cheese and top off with your favorite store bought raspberry vinaigrette dressing. I like a little fresh cracked pepper on top as well. If you are making a salad to go and plan on transferring it to a plate at work or such then there is a little trick I like to do. You build the salad upside down in a tupperware container with the salad toppings put in first and spinach leaves last. At work you flip the tupperware upside down onto the plate and wah-la, salad the right side up. This is especially good trick to do with microwave leftover lunches that you don’t want to microwave in those tupperware dishes. Getting in a rut in the kitchen is a bummer, and it is easy to just cook the same things over and over, so I have a few ideas for changing up your cooking routine to keep things inventive in the kitchen. 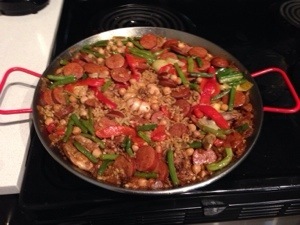 My in-laws gave my husband and me a paella pan for Christmas and we recently made our first paella. Yummy! 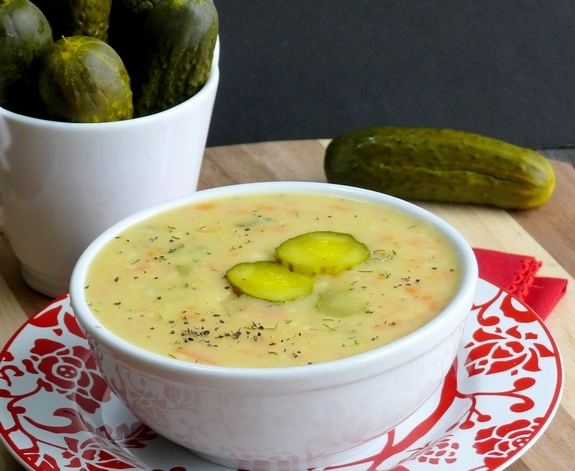 I was cruising on pinterest and found a recipe for pickle soup and thought that would be a good thing to try. I would cut down on the flour next time but it was yummy as is too. I also recently made pretzels at home for the first time. Pinterest can have bad recipes so I always read the comments to see if people are saying them before trying it myself. 2. Subscribe to a cooking magazine. My favorite is Cooks Illustrated and it is the most expensive out of the ones I get but every recipe I have tried from them, I love. I also like Eating Well; it has healthy and easy recipes. Bon Appétit is okay. Sometimes none of the recipes sound interesting to me but I have definitely found some amazing recipes from them. Sometimes you can even do a trial subscription for 6 months for a low amount. I signed up to try Food & Wine for $6 for 6 months. 3. Go the library and check out a cookbook (or buy a new one). I recently checked out a few cookbooks from the library and I think I am going to make it a habit because it forces me to try new recipes and I won’t break the bank either. Sometimes I put food network on for background noise or while I run on the treadmill and get ideas for new food. 5. 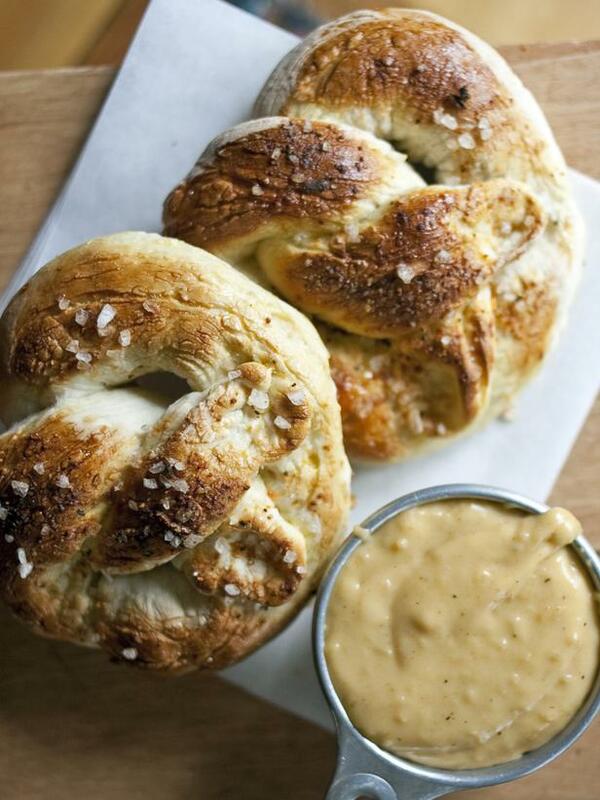 Get ideas from your favorite resturants. 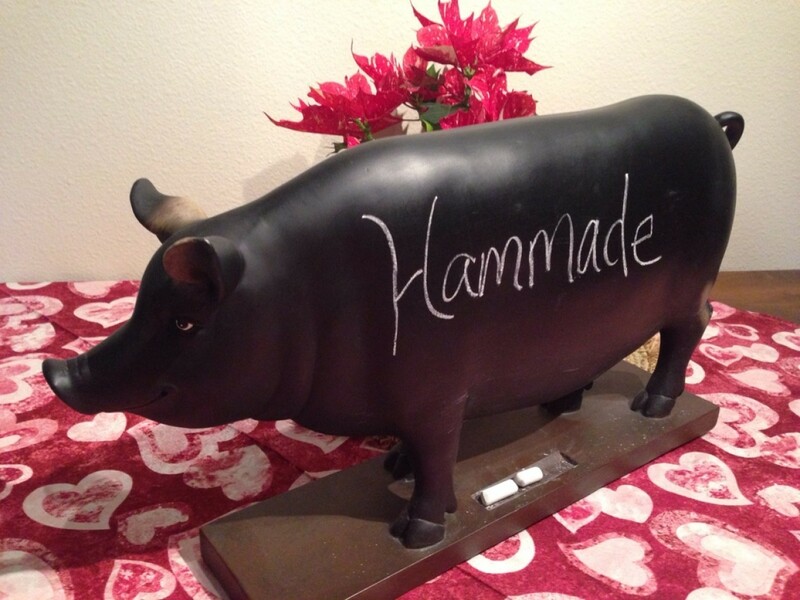 Here is another way to save money and bring your favorite dishes to the comfort of your home. Sometimes the chef even has their own cookbook or is willing to share some of their recipes with good customers. There are literally endless possibilities when it comes to food so go out and seize the food people! A little spice on a classic. 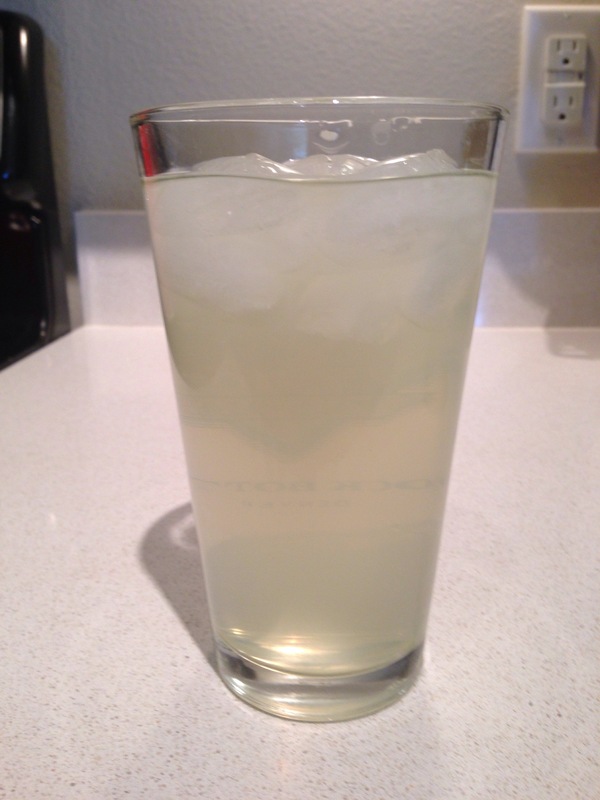 This is an easy thing to do and adds a nice twist to margaritas. All you need are a few ingredients and 1 month to infuse the yumminess into your favorite tequila; I prefer Hornitos because I like the taste and it’s a good value. You only need the first 5 items, but having all items makes it a lot easier. I pour a few shots worth of tequila out of a new 1.75L bottle and into the other (as you can barely see in the picture above). This makes room for when you add the jalapeños. Cut 4 jalapeños into quarters, length wise, and remove white part. Cut the quarter pieces in half making 8 strips per jalapeño; this is so the jalapeños will fit through the bottle neck. Cut them a small enough size so you can get them out of the bottle. Drop jalapeños into tequila, top up with tequila from second bottle to about 1inch from top and recap. I add some seeds; the amount I add is shown above in the 2 right columns of jalapeños. The more seeds you add, the spicier it will be, but the spice will hit faster too (discussed in Tips below). I aim for a subtle after bite of spice. Let jalapeños fuse their spicy goodness for 2 weeks. Pour tequila through filter (or cheese cloth) into a glass container to filter out little bits of jalapeños, seeds and jalapeño slivers. Then pour the tequila back into the bottle (a funnel makes this easy). I usually discard the jalapeños, but you can use them to cook with. Cut 4 fresh jalapeños into 1/8s like before in step 2. Add jalapeños into tequila and let sit for another 2 weeks. I add the same amount of seeds as the first phase. After 2weeks of the second phase, pour tequila through filter and into glass container as in step 4 and then back into the bottle. Now your jalapeño tequila is ready to enjoy. I recommend writing “Jalapeño” on the bottle so you know which tequila is which. I wear gloves so the jalapeño oils don’t get under my nails which is hard to wash off and later you’ll rub your eyes and slowly the sting will remind you where your fingers have been. Amount of seeds: The more seeds you use, the faster and harsher the spice will be. If you infuse the oils from the green, the spice will come on slow and give the tequila a nice after bite leaving you wanting more. When pouring out the jalapeños, they will naturally line up to come out the Hornitos bottles and allow you to just grab and pull them out into the filter. After you pour out the tequila you may need to shake the bottle a few times to get the last few out. I think the Jalapeño Tequila (made with Hornitos) and Freshies Margarita mix make an excellent combination. I typically make them 1 part tequila, 1 part juice or stronger. Beware, these will not taste it, but can be very strong and you might not notice it. 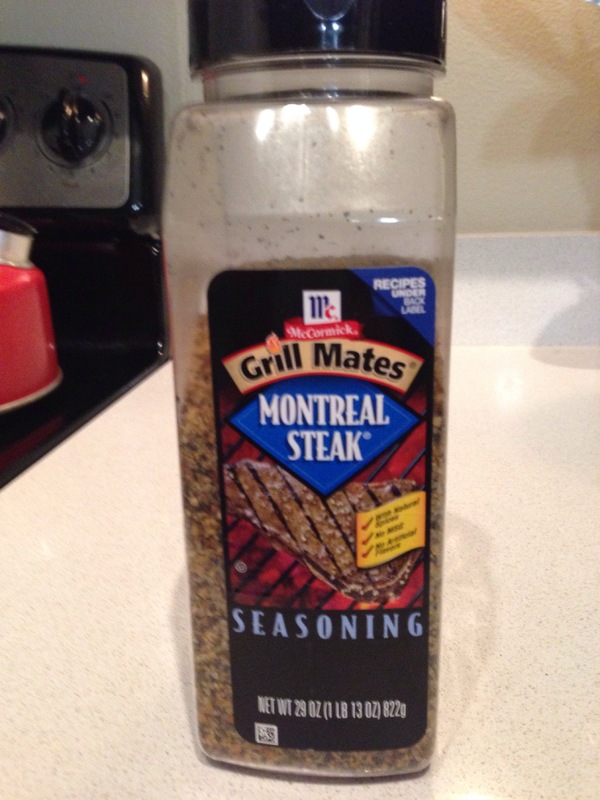 McCormick’s Montreal Steak seasoning is my favorite all purpose use everyday spice. As you can see I have a 1 lb container that I can use to my liking! I think it could be used when cooking almost anything. I would like to share one of my favorite staple recipes. It is very simple and tasty. Pre-heat oven to 400 degrees. Clean and chop potatoes and veggies into bite size chunks. This time I used brussel sprouts but broccoli or onions are both good options as well. If you don’t want any veggies you can also just do the potatoes. 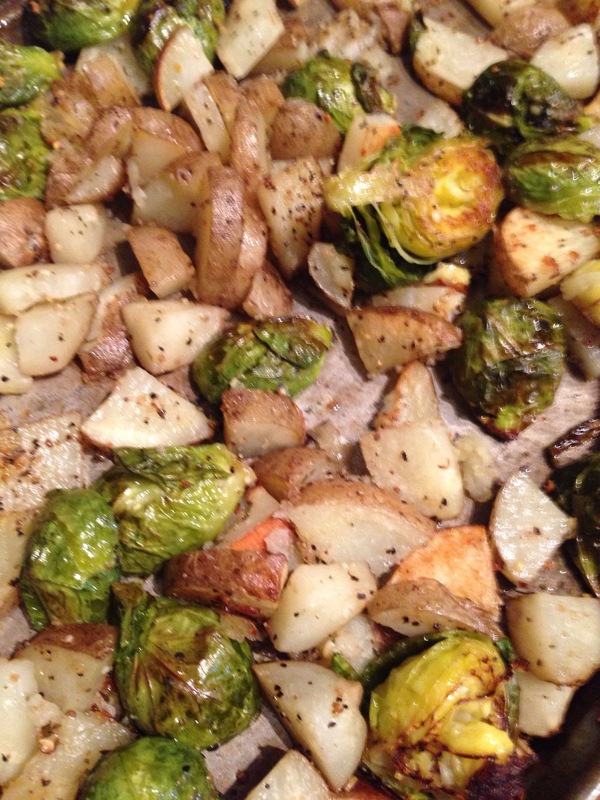 Put the chopped potatoes and veggies into your pan. Drizzle with olive oil, then cover with the seasoning. Wash your hands and then mix the olive oil, seasoning and potatoes all together so that it is mixed well. Then sprinkle another layer of seasoning on the top. Bake for 45 minutes to 1 hour turning once. I don’t want to give exact measurements because I never measure when I make this dish and depending on how much you would like to make it will change how much olive oil and seasoning you will use. This can be used as a side dish and left overs can be cooked with eggs in a scramble for breakfast. Another option for this recipe is to use Lemon Pepper, which is another staple at my house. Does anyone have a favorite spice that I should try?